Ok, I admit it. I don’t like war movies. I’ve never seen Saving Private Ryan, Black Hawk Down, or any of those sort of movies. I am sure that they are absolutely unbelievable gems of the cinema, they are just not my style. So when mom suggested we move from rue Cler to L’Hôtel national des Invalides, I admit, I wasn’t chomping at the bit to get there. 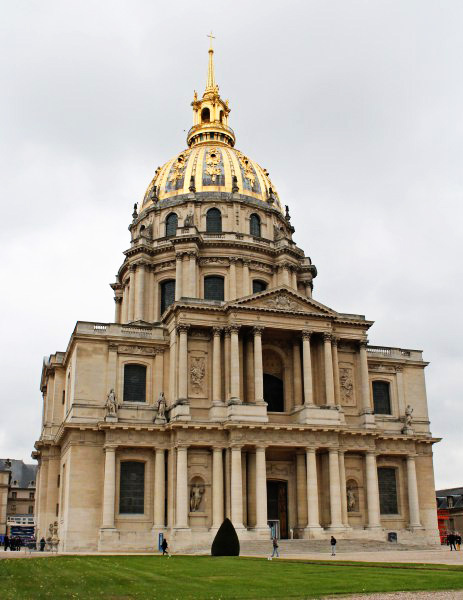 I had seen the extraordinary gilded dome of the Chapel of Saint-Louis-des-Invalides from the outside and as far as I was concerned, that was plenty. 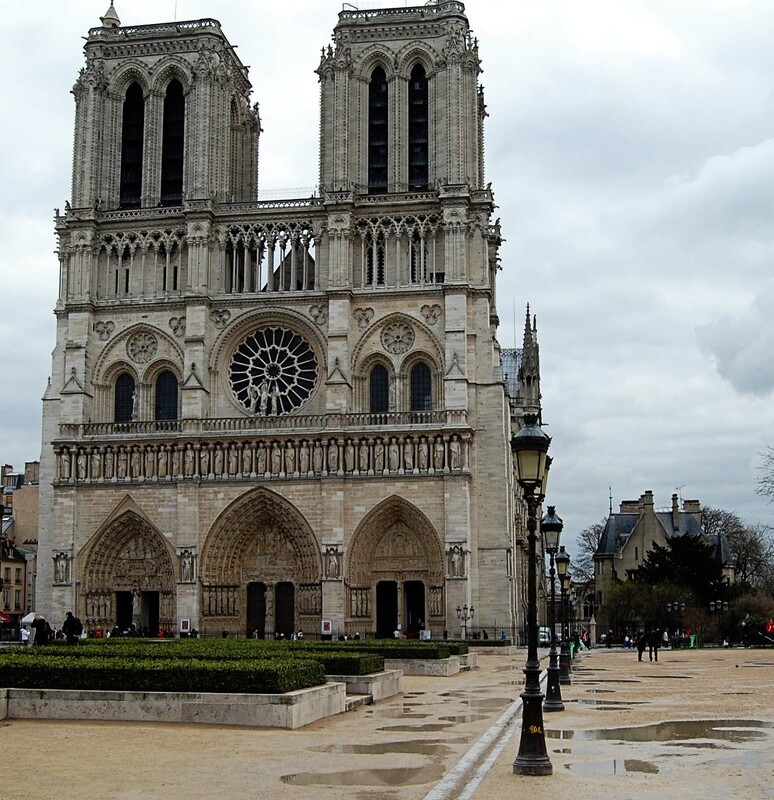 There was no reason to visit museums and monuments dedicated solely to the military history of France. But mom assured me that it was worth the visit, so skeptically I agreed and off we went. Since we were already in the 7th, it was just a quick stroll to get there and since we had just eaten, a little walk was not a bad thing at all! Approaching the complex, you cannot help but be amazed at the opulence of the gilded dome. I briefly wondered if my neighbors would mind if I gilded my roof, but decided that my HOA would likely not approve the change. As you can see, it was a fairly overcast day, it was November after all, but the gilding on the dome still shines bright. 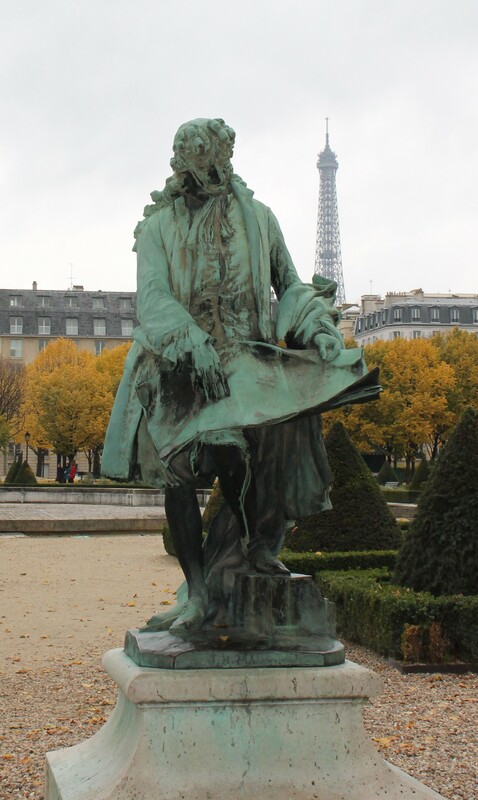 Louis XIV was certainly fond of gold stuff! I hear Versailles is chock full of the stuff, but since I have never been there I can only go by the pics the rest of my family took when they went without me! Still it seems that the famed Sun King used it in all of his decorating and here we are 300 some odd years later still marveling at the glorious glittering monuments that he left behind. L’Hôtel national des Invalides is a vast complex of buildings originally meant to house injured and impoverished war veterans as well as host military parades in the largest of the 15 courtyards, cour d’honneur. Louis XIV included a chapel for the veterans but then decided he needed something different for the royal family and hence the golden dome was born. It is fitting that Louis wanted something for the vets, as the project was funded by a 5 year levy on soldiers currently serving in his military, but I guess it’s the thought that counts! Throughout the courtyard are statues of various military leaders, engineers, designers, etc. In addition, the courtyard houses an impressive array of cannons and large arms which incidentally (and ironically) were commandeered by the Parisian rioters for use against the Bastille on a notable day in mid-July, 1789. The price of admission covers both the tomb and the museums. You should certainly allow several hours if you plan to see both. We were only planning on the tomb part, however, I wish I had taken the time to go through the museums as well. I will certainly be putting this on my list of places I have to see again, especially if I have the kids with me. They like mayhem and implements of destruction. Walking into the Church of the Dome is like walking into most churches…its quiet. It seems like people world-wide lower their voices and hush their children when entering a church. This is why I tend to avoid churches…silence makes me nervous. Call it a side effect of raising two boys, silence usually means they are doing something that will possibly cause a hospital visit or make the nightly news! But the silence here is reverent and peaceful. The interior is its own study in art and architecture. The murals are exquisite and the stone work is impressive. It almost makes you forget you are walking around near large caskets and vaults full or various body parts. The list of the interred reads like a who’s who of French military history for the most part, with some notable exceptions made for certain members of Napoleon’s family. Napoleon II, for instance (I don’t think that qualifies as nepotism, does it?). Each tomb and alcove is different and they are all impressive. 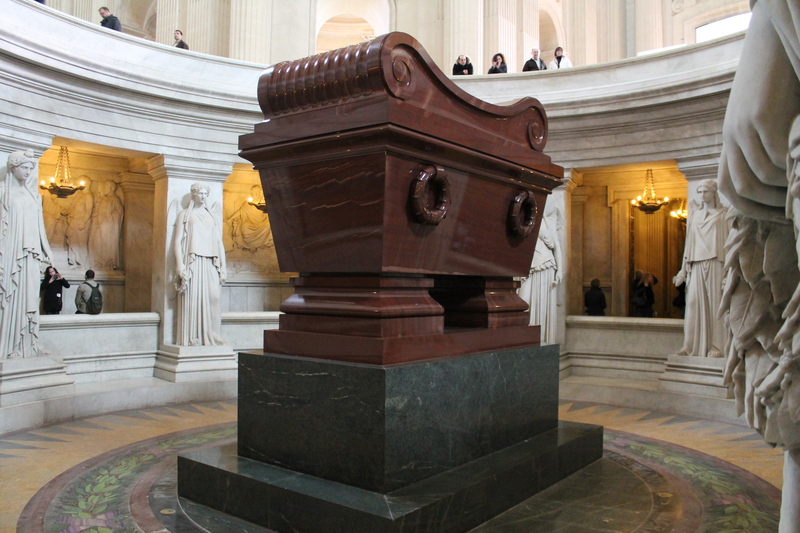 The centerpiece, of course, being the actual tomb of Napoleon. The tomb is crafted in red porphyry, and placed on a green granite base, it is circled by a crown of laurels with inscriptions, which act as reminders of the empires great victories. In the round gallery is a series of low relief, sculptures by Simart. 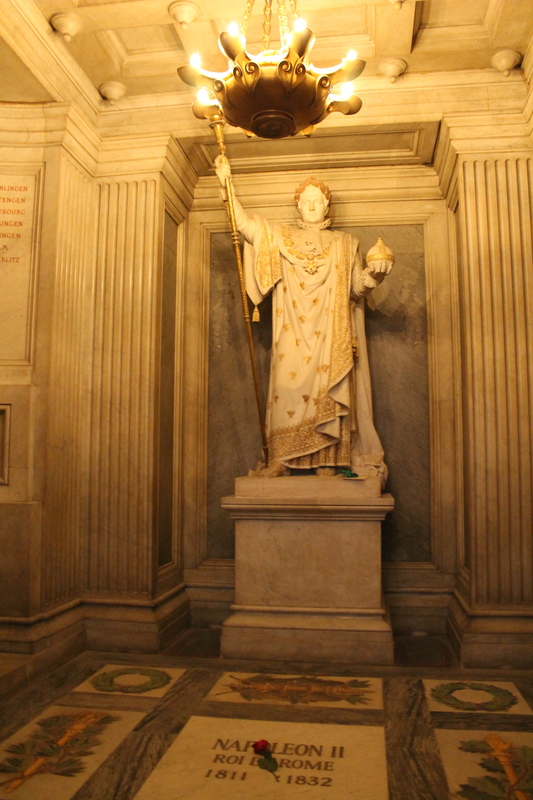 A statue of the emperor, bearing the imperial emblems, is located at the back of the crypt. The remains were locked inside six coffins in this tomb. Surrounding it are a dozen Amazon-like figures representing Napoleon’s victories. In stark contrast to the smallness of the man, everything is done on a gargantuan scale. In his coronation robes, the statue of Napoleon stands 8 1/4 ft high and while historians vacillate on his actual height, the statue might have been a bit on the generous side! Whether he was actually 5’2″ or 5’6″, he’s taller than me so I hope that makes him feel a little better! The grave of the “King of Rome,” his son by second wife, Marie-Louise, lies at his feet. Surrounding Napoleon’s Tomb are those of his brother, Joseph Bonaparte; the great Vauban, who built many of France’s fortifications; World War I Allied commander Foch; and the vicomte de Turenne, the republic’s first grenadier (actually, only his heart is entombed here). Overall, I really enjoyed my visit with le petit corporal. I would certainly come here again, this time to visit the rest of the museum as well…even though it is dedicated to military history…one little (or not) dead guy has changed my mind. This was our last day in Paris, and even though I was crazy sick and it was a super short trip, Paris remains my favorite city in the world and I will take any and every opportunity to visit. We had dinner at Le Malakoff, 6, place du Trocadero et 11 Novembre. It has a bit of a view of the Eiffel Tower if you crane your neck to see it, but we had eaten here on a previous trip to Paris and really enjoyed it, so we decided to go back. It was ok, crowded, slow service, decent food…typical touristy Paris cafe. I am pretty sure I had a burger and so did my mom. I know, go to Paris to eat burgers, but these were really good burgers. We hopped on the metro that is right in front of the restaurant and back to our apartment for the sad, sad chore of packing for our return flight. I have no recollection of how we got to the airport the next morning, but the fact that I am currently sitting at my computer proves that we somehow did. As willing as I am to put up with just about anything on my way TO my vacation, I am certainly a grumpy traveler on the way back. Still, it was great to be able to spend mom’s birthday in Paris…its how all birthdays should be spent! à la prochaine – until next time!